Chester's modern color blocked design is a simple way to add style to your room. This comforter is covered in larges stripes in shades of green and blue. Made from polyester jacquard and a brushed fabric reverse this comforter is soft to the touch and is machine washable for easy care. The comforter set includes two matching standard shams and three decorative pillows that accent the color blocked look. I had been looking for a comforter set to go with a beach theme that we were doing in our bedroom. When I saw this set, I knew it would work perfectly IF the colors shown were the actual colors, and they are! We are very pleased with this set. The name is a little misleading as there is much more blue than green (sage) in this set. Have already had multiple compliments on the beauty of this comforter set. The comforter is true to the colors in the photo. I would say the blue is almost an ice blue. It's a lovely spread. I would caution that it is not a warm comforter if you are using it without a blanket underneath. We are in Texas, and on a 45 degree winter night, I definitely needed an inner (light) blanket. Also, I have a king-sized Tempurpedic bed with box spring, and the edge of the spread at the foot of the bed was not long enough to tuck in. That was great for me, because I have a foot board. So it may be too short for deep mattresses. The California king version is no larger, so just a heads up. This comforter set is gorgeous! I was replacing a 15 year old set and needed a particular color green to match the carpet and walls. This looked like it would work and when I received it I found it was a perfect match as well as being even more beautiful than the on line pictures. I am thrilled with the quality and pattern. The shams and pillows were an added plus! The jury is still out on the bed skirt....not sure I'm going to keep using it. Just not the bed skirt kind of person. Opening the packaging I smelled a horrible chemical smell. I washed the comforter and the smell was almost gone but then it seemed too small for my bed. I only have an 11 inch mattress and the sides were so short that there was four inches from where the bed skirt began...which left a space where the top sheet was showing. I chatted with customer service and they agreed to take it back. Good customer service. One thing about this comforter was that it was beautiful...wish it would have worked for me. This set was good for the price. Decent quality although fabric is thin and shiny. Bare minimum of quilting material. Just barely fit my California king bed. Could have used 3 more inches all the way around. The color was nearly as shown online and very attractive. Still, for the price on sale. it is amazing. I am enjoying this comforter set. Good value and looks great. I ordered a queen-size and if I had it to do over, I would order a king-size as I think this set runs a little short for the deep mattress we have. The only slightly negative comment I have is that we are not ones to turn down the spread - we sleep under it - and it does wrinkle. This set would be absolutely perfect for a guest room that isn't used on a daily basis. 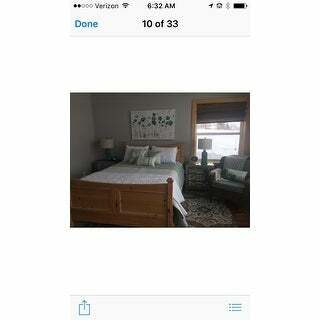 We bought this for our cabin, it's very cozy, has a sheen.. the colors are white, soft steel blue and celery green. Very pretty. Runs true to size. I have a queen bed but bought king comforter due to reviews as u can see its way to wide. I draped a white quilt across bottom for more texture. I'm very happy with my purchase! Quality of product was very poor and looked cheap. Customer service was great and I will return to Overstock. I am a lady of few words, so I will keep this short and sweet. I love this comforter set. It is stylish as well as beautiful. The simplicity of it's beauty will make a difference in a bedroom that needs an uplift. I would highly recommend it to those who are considering a purchase. You will not be disappointed. The comforter set is very shiny. Colors are pretty. Stitching of the pin tucking is fair. Wouldn't pick it again. I just purchased this comforter for my King size bed and it runs a little small on the width. It does not hang down far enough on the sides. I measured it at 90in. although it states 92 in. on dimensions. I have to pull it to one side to get it to cover the side that shows to people when you walk in the room. It is pretty though!! This isn't the most awesome comforter I've ever had but it is pretty and does cover the bed nicely. It clearly states that it is polyester so I can't complain about that but I wish I would have been more careful when selecting my preferred fabric. It is a great product for the price, especially considering it comes with so many accessories. Its also very washable which is definitely a plus. All in all, above average. Beautiful set, very reasonable price. Love the colors and the finish on the material, silky but not too shiny. Love the Beautiful design and colors. The texture and filling is not quite what I expected. Not sure how will hold up after a washing. Only time will tell. I absolutely love the color and the texturing on the comforter and shams. The pastel colors create a calming and peaceful feel to the room. The only problem I see is now I need to buy the matching curtains to complete the room. The three decorative pillows are a nice touch to complete the bedroom. It appears to be of nice quality and the price is definitely a plus. The comforter set is pretty in color but seems to be on the cheap side. The threading was not done well and doesn’t lay properly. The feel is itchy and irritating to my skin. Love the color combinations of this comforter set! I bought it for my condo in Florida and I haven't been there since the purchase. I know it will look great. Hopes it wears well. Very nice. In my guest bedroom with the bed I also purchased. Absolutely love the colors and the material is top notch. "What is the weight of this comforter?" The weight of the comforter is approximately 14 pounds. "Do you have the same set in gold and white"
"is there any valances to go with this set"
"I have a King size bed with a tuffeted bed frame and back...should I size up to the California King bedding or will the King size work?" If you have a King then you should order a King. I hope this helps. "Hello, My dog got to the bedskirt of this item is it possible to replace - I so love the set!" At this time the bedskirt cannot be purchased individually. I love the set as well. I am not using my bed skirt as I have a sleigh bed. I didn't use the bed skirt for my set and It looks absolutely beautiful with my bed :-) I love this set. "Yes it is light sage green and great combo with the blue. I LOVE this set"
What are the dimensions of the bed skirt on the queen size? Need to know the drop length.Thanks.